A graduate from the Academy of Fine Arts in Warsaw, Dorota Kobiela was awarded the “Minister of Culture scholarship” for special achievements in painting and graphics for four consecutive years. Through friends Dorota discovered animation and film, and immediately threw herself into learning these new artistic disciplines, attending The Warsaw Film School, Direction Faculty. She has directed one live action short film, The Hart in Hand (2006) and five animated shorts – ‘The Letter’ (2004), ‘Love me’ (2004), ‘Mr.Bear’(2005), Chopin’s Drawings (2011) and Little Postman (2011). Little Postman was the world’s first, and to her knowledge still only, Stereoscopic Painting Animation film, and won Stereoscopic Best Short Film at the LA 3D Film Festival, 3D Stereo Media (Liege), 3D Film & Music Fest (Barcelona). Hugh graduated with a degree from Oxford University in Politics, Philosophy & Economics and a vague notion of wanting to make films. He supported himself through teaching history, selling carpets, and even selling fish, while he joined various grass roots film cooperatives in London. After a few disastrous experiences, where the drama was all behind the camera instead of in front of it, Hugh sought out training at The National Film & Television School, Producing Department. He got his first professional experience producing short films for Monty Python, and then set up BreakThru Films. In 2008 Hugh was awarded an Oscar for BreakThru’s first major production, Peter and the Wolf. The film also picked up several other top prizes including the Annecy Cristal and the Rose D’or. Peter and the Wolf premiered at a sold out Royal Albert Hall accompanied live by Philharmonia Orchestra, then at the Hollywood Bowl, and has since been performed at over 70 concert halls worldwide. His next film, Magic Piano & the Chopin Shorts premiered in Beijing’s Forbidden City with pianist Lang Lang, then at London’s South Bank Centre and New York’s Lincoln Centre, and has since been performed in 30 major venues around the world with live solo piano accompaniment. Aside from film Hugh has produced and edited the Graphic Novel series, HOUND, by Paul Bolger and Barry Devlin, winner of Best Graphic Novel, Best Story and Best Artwork at Irish Comic Awards. Sean graduated from the University of Virginia with a BA in International Relations, and three weeks later ended up in Poland with the Peace Corps. Sean enjoyed his time in Poland so much that he kept pushing back his return to the US, and looking for excuses to extend his stay. During his time in Poland Sean has started work on a doctorate, worked as a journalist and a translator, and finally started up with friends one of the leading multiplex cinema chains in Poland – Silver Screen - where he held the roles of CFO and then CEO. After merging with Multikino in 2010, Sean thoroughly intended never to work as hard again as he had at Silver Screen, but was persuaded by Hugh that joining BreakThru and becoming a producer would be an ideal part time occupation for him. While Sean no longer takes everything that Hugh says at face value, he has acquired the film making bug, and will certainly be producing more films. Ivan joined Trademark as a Producer/Executive Producer in October 2010. Formerly Director - Film and Media Funds for senior debt financier BMS Finance, he has 20 years experience in film financing having worked in a variety of finance and business affairs roles for companies including BBC Films, BBC Worldwide, Baker Street Media Finance and Stewart Till’s Signpost Films. He has been involved in the financing of a number of successful British films including Made in Dagenham, Moon, Bend It Like Beckham, Billy Elliot and Shallow Grave. David has worked as an independent film and theatre producer for over 20 years. His film credits include Henry V,Peter's Friends, Much Ado About Nothing, The Madness of King George, Mary Shelley's Frankenstein, Twelfth Night, The Wings Of The Dove (both nominated for four Academy Awards), Shakespeare In Love (winner of Seven Academy Awards including Best Picture and four British Academy Awards including Best Film), Gangs of New York, (Production Consultant), I Capture the Castle, Chasing Liberty, A Bunch of Amateurs and My Week With Marilyn. In April 2007 he co-produced, with Finola Dwyer, the critically acclaimed theatre production of Elling at The Bush Theatre and in the West End. David is Chairman of Film London and a former Chairman of BAFTA. Before moving into film & theatre production, David worked as an actor. Charlotte Ubben grew up in San Francisco. She performed with the American Conservatory Theater's Young Conservatory, which is where she found her love for performing. Charlotte attended Northwestern University for two years where she studied vocal performance. But she left the cold for Malibu and received her BA in theater with a minor in music from Pepperdine University. Charlotte joined Maven Pictures and started RBF Productions in 2014. She executive produced Tallulah, which participated in this year's Sundance Film Festival. She currently lives in Los Angeles with her husband and three dogs. She can be seen in the upcoming films: The Wilding, Freak Show and Landline. Laurie began loving Vincent van Gogh in 1971 through the words of Don McLean in Starry Starry Night—a song which at the time took a back seat to Mr. McLean’s other tribute to fallen artists, American Pie. Starry Starry Night tenderly portrayed Vincent’s struggle to do his work amidst judgment and misunderstanding. It broke Laurie’s heart. But to feel deeply enough to have one’s heart broken was rarely celebrated then nor is it now. So she is grateful to Vincent and his brother Theo for their correspondence that beseeched the world to find inspiration in Vincent’s art and in his life. They were earth angels whose gifts the world has only just begun to appreciate. Laurie and her husband, Jeff have three children, Charlotte Grace, Josephine Margaret and Theo Vincent as well as an assortment of animals (last count: 37). They are to her the flaming flowers that brightly blaze in a simultaneously beautiful and hideous world. Laurie is and will always be drawn to an underdog. A longtime collaborator of director Darren Aronofsky – for whom he has scored Black Swan, Requiem For A Dream, The Fountain, The Wrestler, Noah and Pi – Mansell is Grammy and Golden Globe nominated. In addition to his impressive work on Aronofsky’s films, Clint received major acclaim for his 2009 score for Duncan Jones’ directorial debut Moon, and most recently for Ben Wheatley’s High-Rise. Piotr graduated from the Lodz Academy of Fine Art, and did whatever jobs offered to him if they involved painting, including painting shop signs, large scale freizes, and theatre sets. When there weren’t painting jobs Piotr worked at casual jobs to leave himself free should any painting jobs come up, including being a grill chef. One of his painting jobs involved painting the forest backdrop and moonlit night backdrop for BreakThru Films’ Peter and the Wolf. 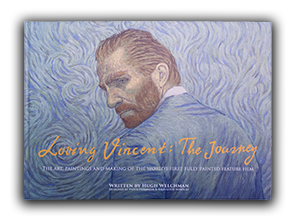 Following this he was appointed head of painting on Dorota Kobiela’s short film, The Little Postman, and then became one of the ‘gang of four’ painters involved in the R&D and painting the concept trailer for Loving Vincent . Along with Dorota Kobiela and Tomek Wochniak, Piotr designed the Painting Animation Work Station. Tomek started working with BreakThru Films as head of IT on Peter and the Wolf, and had the same role on Magic Piano and the Chopin Shorts, after which he became Head of the Studio at BreakThru’s facility in Gdansk, and Production Manager on Loving Vincent. Tomek along with Dorota Kobiela and Piotr Dominiak designed the Painting Animation Work Stations. A cinematographer for 26 years,Tristan has worked across the disciplines. His long collaboration with director Nick Park includes Academy award winners, ‘Wrong Trousers’, ‘A Close Shave’ and ‘Curse of the Were-Rabbit’. Lukasz Zal – Oscar and BAFTA nominated DOP of Academy Awarded IDA directed by Pawel Pawlikowski. For IDA, his feature debut, Lukasz has won multiple cinematography awards including Golden Frog/Camerimage 2013, 28th Gdynia Film Festival, 29th Warsaw Film Festival, 20th Minsk International Film Festival Listapad, 20th Warsaw Jewish Film Festival, ASC Spotlight Award, Medias Central European Film Festival Award, The San Francisco Film Critics Circle Awards, PSC Award, EFA Award. In 2008 Lukasz has been graduated from the Polish National Film School in Lodz. Lukasz graduated with a masters in Animation from Krakow Academy of Art, after which he started work in CeTA in Wroclaw working across Computer Graphics, Animation and Motion Control. When CeTA became a co-producer on Loving Vincent Lukasz started working on the production as a Motion Control operator, but because of the combination of his in-depth technical knowledge, keen artistic eye, feel for animation and his infinite patience he was quickly promoted by Dorota and Hugh to be Head of Visual Effects. Justyna graduated from The Lodz Film School. Her graduation film, MC Man of Vinyl, won the Grand Prix at the Taiwan International Film Festival, among others. Upon graduating she joined BreakThru Films, working as an Assitant Editor on The Magic Piano, and Consulting Editor on the Chopin Shorts, and since she has been editing on Loving Vincent, and also working on the Visual Effect and doing the occasional bit of acting, when required. Michal set up NoiseRoom with Pawel Luczak in 2005. Prior to that Michal worked as a sound engineer for TVN, Poland’s main commercial TV station. Noiseroom has worked on over 50 projects, including the feature film Weekend (Director Cezary Pazura), and the popular ‘Magda M’ TV series (TVN). Jacek Dehnel, born in 1980, is a poet, novelist and translator. In 2005 he was one of the youngest winners of the Kościelski Prize for promising new writers. He has published five volumes of poetry and nine of prose. His first novel, "Lala", awarded with Paszport Polityki, tells the story of his grandmother's life. His second, "Saturn", is based on the life of Francisco Goya, and depicts his painful relationship with his son. His third, "Mother Makryna", tells the true story of a nineteenth-century fraudster who claimed to be an oppressed Catholic nun. His most recent novel, "Krivoklat" is the monologue of a lunatic compelled to destroy great works of art. With Piotr Tarczyński he is co-author of two crime novels set in turn-of-the-century Krakow, whose crime-solving heroine is a bored professo's wife and first-class busybody. Several of Dehnel's books have been translated into foreign languages. His novel "Saturn" is available in English (Dedalus, 2012) In 2017 two more will follow: "Aperture", a poetry collection translated by Karen Kovacik (Zephyr Press), and the novel "Lala", translated by Antonia Lloyd-Jones (Oneworld Publications). Dorothée Roqueplo is considered to be one of the best Polish costume designers. In her portfolio one may find dozens of feature films and theatrical performances. She has worked with the most prominent Polish directors, among others: Krzysztof Zanussi, Lech Majewski, Krzysztof Krauze and Jan Komasa. Dorothée is a multiple nominee and winner of the Orły [Eagles] – Polish Film Awards. She has also received awards for costumes at the prestigious Polish Feature Film Festival in Gdynia, i.e. for: Mój Nikifor [My Nikifor], Młyn i Krzyż [The Mill and the Cross], Sala Samobójców [Suicide Room], Hiszpanka [Spanish flu]. Dorothée is a member of Polish Film Academy and European Film Academy. January joined the BreakThru team in 2012, as one of the original ‘Gang of Four’ who painted the Test trailer. Over the next two years during the development period January was one of the three artists responsible for storyboarding the film, and also was in charge of developing the style for the Black and White Oil-painting animation feature in the film. January was part of the supervisory team in charge of testing and training the painters, and was in overall charge of Supervising the Black and White sequences of the film. Wiktor was part of the first group of painters selected to work on Loving Vincent. His skill in re-imagining Vincent’s style into different environments led to him being selected by Dorota to be the main Design Painter, and along with Jerzy Lisak and Lukasz Gordon established the ‘NoirVincent’ style for the night time scenes in Loving Vincent. After most of the Design Paintings were completed Wiktor was sent to Athens to test, train and supervise the ‘Greek Team’ of 20 painters, based at Studio Mabrida. Anna was part of the first group of painters selected to work on Loving Vincent, and quickly amazed us with how quickly and intuitively she took to animation. She was part of the supervisory team in charge of testing and training the painters. On the film she has animated some of the most ambitious shots, created many of the design paintings, and is the Painting Animation Supervisor in charge of the Doctor Gachet and Marguerite Gachet painting animators. Monika Marchewka, born in 1988, graduated from the Faculty of painting at the Academy of fine arts in Kraków. During her studies she attended Jerzy's Kucia Animation Drawing Studio. Monika has lived and worked in Gdansk since 2014, when she joined BreakThru as part of the advance group of painting animators. In addition to her work on Loving Vincent, Monika also was part of the painting animation team for "Nad Ranem”-an animated music video produced on the 70th anniversary of the Warsaw Uprising. For Loving Vincent, Monika began as a design painter, later a painting animator, and due to her keen eye and understanding of animation was promoted to Painting Animation Supervisor. Monika is currently developing her own project to be produced by BreakThru based on the work of Henri Toulouse Lautrec. Ewa is the only supervisor not to come from the first group of Loving Vincent painters. She joined the team 6 months into production, and quickly impressed us with her wonderful Black and White reconstructions. She was promoted to Painting Animation Supervisor to run the tests and training of our Wroclaw team of painters in CETA studios. Marlena joined the BreakThru team in 2012, as one of the original ‘Gang of Four’ who painted the Test trailer. Marlena was part of the supervisory team in charge of testing and training the painters, after which she decided she missed painting animation too much to continue as a supervisor, electing instead to be one of the painting animators. As well as animating an array of amazing shots in the film Marlena has painted many of the Design Paintings establishing the style of the film. Bartosz was part of the first group of painters selected to work on Loving Vincent and was quickly given the nick-name ‘Arm of Vincent’ by the other painters due to the ease with which he recreated Vincent’s style. Bartosz was part of the storyboard team and then specialised in doing the Design Paintings of each of the actors as their Vincent character, and since has been animating part of the epic opening shot of the film. Jerzy was part of the first group of painters selected to work on Loving Vincent. His work on ‘The Night Café’ scene led Dorota to choose him to be one of the main Design Painters, who along with Wiktor Jackowski and Lukasz Gordon has defined the ‘Noir Vincent’ style of the night scenes in the film.